Brand new for 2018/19 season, 450 Lagoon Floatation Therapy’s modern design offers a lot of useable space for her length. 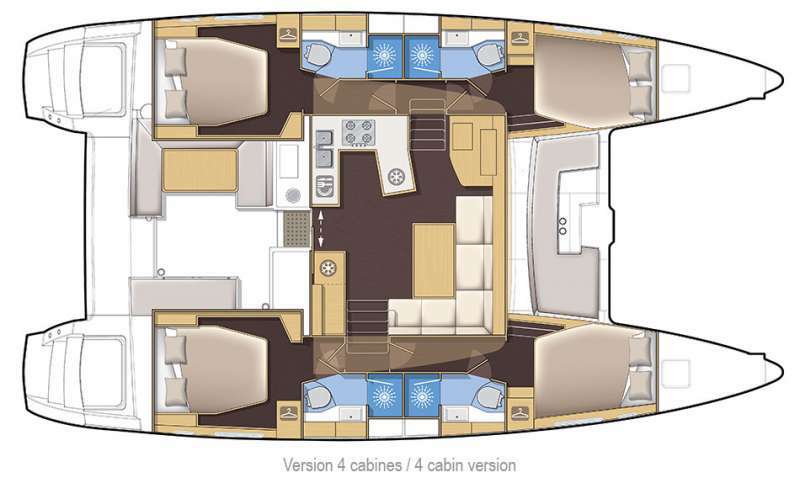 The catamaran features a flybridge with helm station, an uncluttered covered cockpit dining area, seating forward behind the trampolines and three comfortable en-suite guest cabins. Floatation Therapy is an attractive, bright charter yacht with an excellent crew ready to take your group on a vacation to remember in the Caribbean Virgin Islands! Save $250 per child per week for each child 15yo and under at the time of sailing. Available now through 31 Dec 2019. Confirm before 1 Dec 2019. Why you should book Floatation Therapy! Captain Andrew and Chef Michaela have been working on day sailing and crewed charters for over three years, exploring all throughout the US and British Virgin Islands. They have been spreading their passion for sailing, snorkeling, and all-around adventuring to hundreds of guests from all over the world. Andrew and Michaela offer their guests an insider’s look into the splendor of the Virgin Islands. Upon receiving his USCG Master Captains license, Andrew decided to move "Down Island" to pursue his dream of becoming a full time Captain. He is now excited to continue chasing his dream, and to share his love for all things ocean with all of his guests, as he continues to grow as a diver, surfer, chef, host, bartender, and lifetime sailor. Born and raised in the Virgin Islands, Michaela spent her childhood working at her father's dive shop on St. John. Spending her formative years scuba diving, sailing and snorkeling she considers her-self a professional mermaid. While receiving a bachelors degree In Long Island, NY, she also gained 4 years of experience in the service industry, in both front and back of the house positions. She was drawn to the creative, but structured aspects of kitchen life and returned to the islands with a passion for food and hosting. Michaela has spent the last three years honing her expertise and skill in the yachting industry in the Virgin Islands. Highly knowledgeable about local waters and hotspots, she is excited about sharing her unique and beautiful home. She has a super energetic spirit that keeps her constantly looking for adventure and new friends. Collectively Andrew and Michaela have traveled to 45 countries and are on a constant quest to grow and learn, while sharing their passions with others. They fell in love surrounded by the turquoise water of the Caribbean and soon after realized they made spectacular sailing partners. Their dream became a reality on a Summer sailing trip to the Greek islands, confirming their belief that life on the water was meant to be their career. With their professional sailing experience, unique island expertise, and impeccable hosting backgrounds, they are ready to treat their guests a one-of-a-kind vacation. Contact us for rates and current availability or to book a charter aboard Floatation Therapy! We must say that the trip was absolutely spectacular. Everything was great and both Michaela and Andrew were outstanding. Michaela a Master chef and scuba diving teacher and Andrew a true and passionate Captain. The food was delicious and very well presented. The variety of dishes was very impressive. Michaela is a true Master Chef. It was most of the time adjusted to our preferences. We would love to do this trip again and we have already given the link to sailingdirections.com to many of our friends. We highly recommend Sailing Directions. Great team Andrew and Michaela, Scuba Dives that were one of the most beautiful our divers had seen. We appreciate that the food, drinks were very generous. Thank you so much for all your help on this trip. Michaela and Andrew could not have been more friendly, knowledgeable, attentive and accommodating. Spending six days and nights in relatively tight quarters was managed to perfection by those two. They were in sync the entire time and worked like a well-oiled machine. They were so comfortable and pleasant to be around. Flip Flop was a great boat. They kept it immaculate throughout the duration of the trip. We did not have a bad meal on the boat. Truth be told, we didn’t have a meal that was any less than fantastic. We had one meal on land and regretted it. The whole time we said things like, “Michaela would do a much better job than this. Michaela makes a better cocktail than this. Michaela’s presentation is world’s better than this etc.”. The food was plentiful but not gigantic portions. We loved that. Also, it was all so fresh and beautifully plated. It was obvious that she had carefully read about our preferences and tailored her menus accordingly. The itinerary was perfect. Just the right combination of movement, beaches, snorkeling, bars, etc. Sailing Directions website is absolutely fine and easy to navigate. John, you did a great job. Specifically, you always got back to me quickly which I appreciated. Additional comments: I want to say something about Andrew and Michaela and their relationships with my kids. A bonus that I only realized after our week was the relationship established with our kids and those two. For my 24 year old son, Andrew was a cool respite from dealing with the estrogen of his sisters. They played games, read the same book, and simply had a nice time together. For my 22 and 19 year old girls, they saw in Michaela an interesting, smart, capable young woman pursuing her dream and being an equal and complimentary partner to her guy. I treasure that part of our vacation. When you chat with Andrew and Michaela, please pass along our gratitude. Captain Andrew and Michaela were terrific. They made this trip very special. They worked really hard to make everything work, always with a smile on their faces. Michaela cooked 3 excellent meals everyday - a lot of work! And they were always paying attention to the smallest of details. I can't stress how happy we were with them. I hope our paths cross again. Flip Flop was in good condition, clean, all systems working properly. Capt. Andrew made sure we hit all the spots we wanted to go, suggested great off-the-beaten-paths and interesting hikes. With Sailing Directions, communication was easy, handling of documentation effective. We referred a friend. I don't think it would be possible for a crew to be more friendly, knowledgeable, attentive and accommodating. Flip Flop was indeed comfortable, clean, and well ventilated - Andrew and Michaela cleaned constantly and were quick to respond to any request. I believe that the interaction with the crew may have been everyone's favorite part of the trip. The food was exceptional, and the menu adjusted to allow for one gluten-free and one fish-free diet. The presentation was as nice as any fine dining restaurant I have been to. Captain Andrew did a great job. He adjusted the original itinerary to make appropriate allowance for weather and the desire of the group to spend time on beaches. It was a great experience for all.